Get started learning the Cloud. Schedule our instructor led classroom training at your convenience and never miss another lecture or fall behind. You are in complete control. The Best Microsoft Certified Trainers in the industry have helped us develop the ultimate training & certification program which includes everything you will need to fully prepare for and succeed in the workplace. Our Computer-Based Training is a cost effective method that meets the critical demands of computer users. Experience our expert-led computer training courses in a comfortable and convenient environment. You get the feel of a computer training school delivered through flexible and familiar technology. 12 Months Unlimited Online On-Demand access to Real LIVE Practice-Labs that allow you to experience practical application of course concepts in authentic online live lab environments. Retain your knowledge and feel confident in your new hands-on skills by practicing with real software and hardware in real time anywhere at any time. Kenneth Mayer - Microsoft Certified Trainer (CCSI, MCT, CCNP, CCDA) is certified as a security consultant, Ethical Hacker Trainer, and Microsoft Trainer. He began working in the computer technology industry during the 1980's. He has consulted various Fortune 500 companies throughout the world about IT training issues. 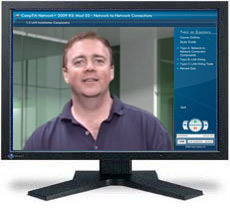 Ken is also certified as a Cisco Systems Instructor. To become certified with Cisco, he organized a 2 day observation and lab seminar in France. Ken has taught all the Cisco CCIP, CCDP, CCNP, CCDA, and CCNA classes, in addition to its security appliances, which includes IDS and PIX.